Provides a full 5 Tons of cooling power - up to 2000 square foot coverage per machine at 9' ceilings, if walls / ceiling are insulated. Excellent for large rooms, gyms, buildings, small warehouses, workshops, etc. Calculate 1 ton for each 400 square feet at 9'. A 2000 square foot space with 9' ceilings would require 5 tons: 1 ton for every 400 square feet means this space would require 5 tons to cool effectively, provided that the room is insulated. Another example: If the room is 1000 square feet with 18' ceilings, 1 ton will only cover 200 square feet because ceilings are twice as high (2 x 9'). To cover that 1000 square foot space with 18' ceilings. With 1 ton per 200 square feet, 1000 square feet woujld require 5 tons or one KIB 6021 unit, provided that the walls and ceilings are insulated. If walls and ceilings are not well insulated, coverage is cut in half again because of cool air loss, so you would need 2 units. Width x Depth x Height (Inches) 27.325" x 51" x 53"
The Model KIB6021 (nominal 5-ton or 60,000 BTU) is the smallest unit possible in size and capacity in The Iceberg Series, KwiKool’s Flagship Line of portables for both primary and backup air conditioning. With its full-featured design, high sensible cooling and balanced air system, the KIB6021 is the perfect solution for cooling server rooms, gyms, office areas, workshops and more. The Iceberg Series is quick and easy with its “plug and play” technology and tops the competition in its small size, big performance and tons of features. From its hi-tech microprocessor controls and self-diagnostics, to the long list of standard features (most of which are not even available in other brands), the Iceberg Series out performs, out lasts, and out features other portables and all at a price that is comparable to the no-frills products that are also available online. Kwikool is, by far, the best deal. All Iceberg Series units come standard with our exclusive I/O Integral Condenser Dual Ducting that provides isolated and balanced air pressure within the space for maximum cooling efficiency. The condenser utilizes THD, KwiKool’s exclusive Twin Hyperdrive Technology. The KIB6021 has automatic restart after power failure and runs on a 230-volt/50-amp Single-Phase circuit, which must be installed by a qualified electrician. The unit comes with an internal high lift condensate pump and a 5-gallon exterior condensate tank with float activated unit cut off for short term use. 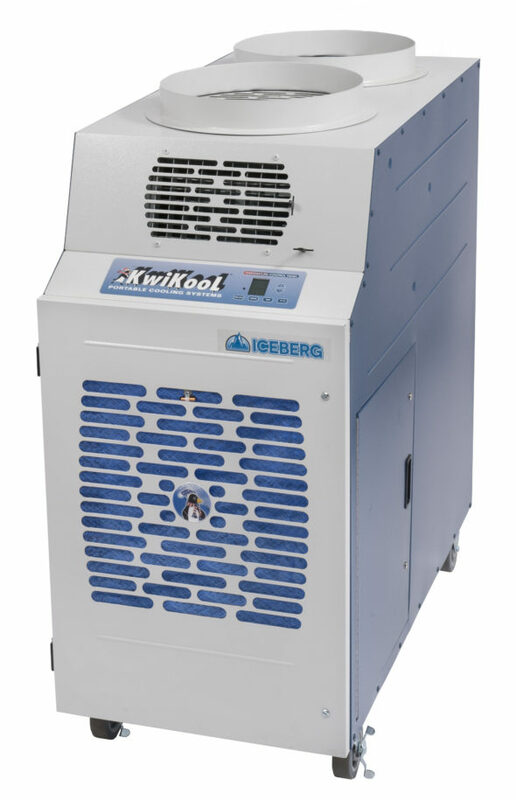 Order your Kwikool Iceberg 6021 Portable Air Conditioner today and feel the difference a REAL portable industrial air conditioner can make! All KwiKool products are proudly MADE IN AMERICA. There are not many official online retailers of Kwikool air cooling products and unfortunately the internet is full of scams. As a general rule of thumb, if the deal seems too good to be true, it probably is. Cheap cut rate online deals often end up being a used or refurbished unit, which do not come with Kwikool's top rated warranties. Or even worse, you may end up buying a cheap discount air conditioner that doesn’t have the energy efficiency, features or warranties provided by top-rated Kwikool portable air conditioning systems. Our innovative partnership with Kwikool allows us to ship directly from their warehouse, which cuts out the middle man, saves shipping time, and eliminates the high operating costs of traditional brick and mortar big box stores. These savings get passed directly to you, allowing us to offer brand heat-eliminating Kwikool portable air conditioners and accessories at the best possible everyday cheap discount online sales prices. And buying from us is definitely better than direct-if you buy direct, you'll have to pay shipping. Buying from us, you always get fast free ground shipping as our thanks to you for shopping with us. If you have any questions give us a call or send us an email and one of indoor air quality experts will be happy to help.